A neutral highlight colour from the Holiday 2011 collection. A light, pinkish lavender shimmery pearl… The lavender tone is so light that it’s nearly neutral and it makes a fabulous one color wash with a little winged liner. Travel friendly, and super easy to use – with pre-designed looks to make your life easier. To use them just pull the wand out of the vial, give it a little tap and apply. It’s not a product that everyone is going to love, and it might take you a little bit to warm up to it. BUT that first busy morning when you needed to leave the house 5 minutes ago – you’ll fall in love. The packaging is perhaps the most obvious new thing but I want to talk about the least obvious first – the addition of Caprylic/Capric Triglyceride to an SN eyeshadow. More commonly known as Fractionated Coconut Oil (FCO), this ingredient is odourless, adds slip and has a very long shelf life, thus making it highly desirable in the cosmetics industry. In the forum I frequent, FCO is a popular pressing agent. 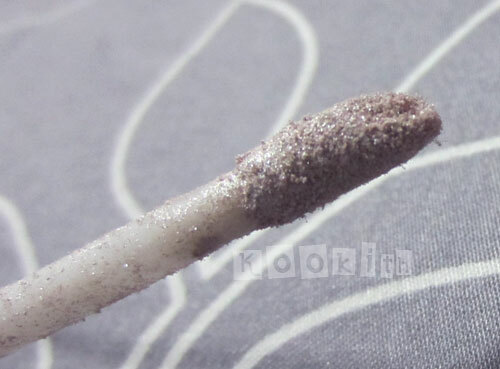 Karen had stated on the SN forums that to make the eye wands easier to use and also to minimise flyaways, she had added a few drops of FCO to keep the minerals clumped together on the wand applicator. Thus, the result was an eyeshadow that applied like a dream come true. 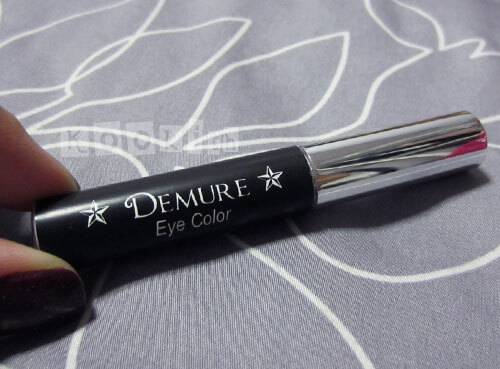 The texture of Demure is creamy and very easy to blend. 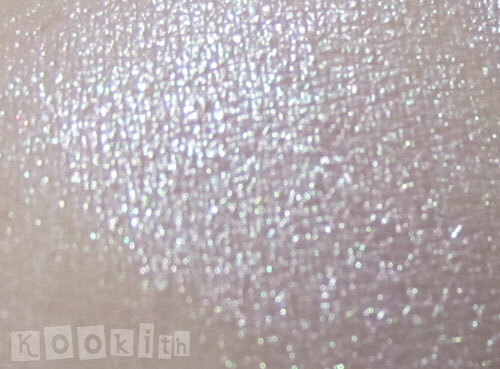 As the eyeshadow is slightly ‘wetter’ than loose minerals, those who do not use a primer would notice that the eyewand shadows are more vibrant, with similar colour payoff to foiling. However, I strongly recommend using a primer even if you don’t have oily lids, because otherwise, you are wasting the full potential of the eyeshadows, and SN eyeshadows are stunning! I am not going to bother describing Demure other than declare it GORGEOUS. 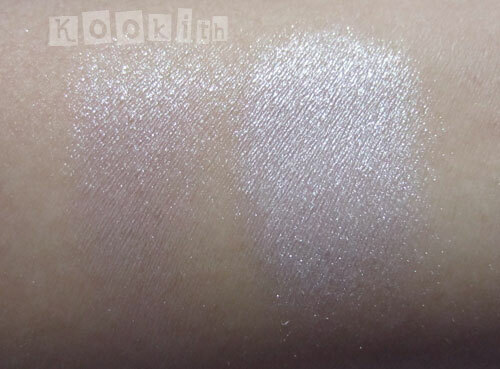 Instead, I’m going to bombard you with swatches so you can see for yourself. There is something very special about this colour. 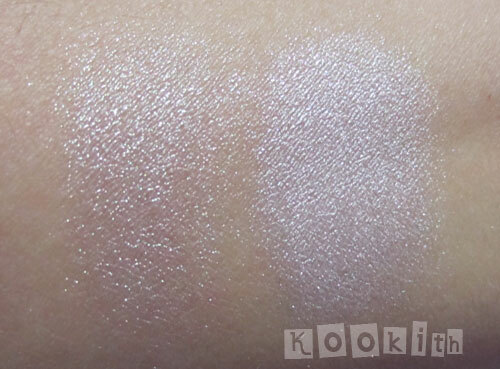 These are the same swatches but every time I tilted my arm differently, the light would hit the swatches in varying angles and the shadow would morph from white to off-white to lavender. In order to be a better blogger, I am constantly learning from other bloggers to improve my own skills. 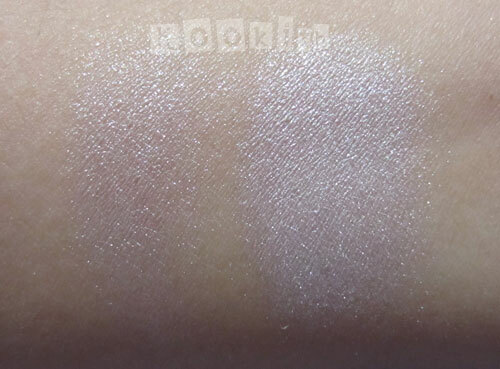 Aud once mentioned before that most blogs tend to show swatches applied very intensely, and I totally agree that it is completely unrealistic as we don’t apply them this way on our eyes. 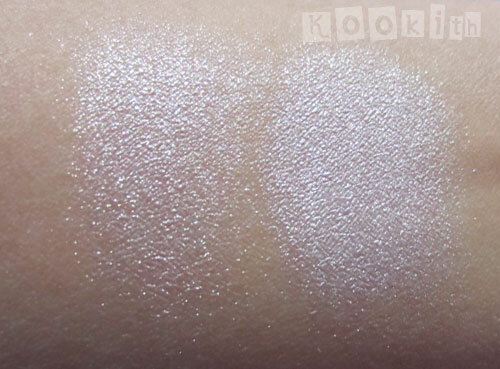 Therefore on the left, I’ve applied the eyeshadow the way a normal person would on their eyes – lightly and blended out. On the right, the eyeshadow was applied very thickly, the way one would perhaps during Halloween. I couldn’t resist including a blurry close-up of Demure. Check out the pink and green shimmer! As Barney Stinson would say in his falsetto, AWESOME! Okay, so the eye wand. I HATE IT, yes I do. It may be travel-friendly, but so is a jar with a cotton ball stuffed on top of the sifter, and I get lesser mess with the latter. After reading scathing reviews about the eye wand on my forum, I was prepared and ready. I held the tube upright and tapped it to settle the minerals to the bottom. I then gingerly unscrewed the cap over a large sheet of paper with my right hand while holding it steady with my left, and slowly inched the cap upwards with my first 3 fingers, while holding onto my last 2 fingers with my left hand so that the cap didn’t separate too quickly from the tube. All was good. When I felt the wand applicator hit the stopper, I slowed down and used a little bit of force to pull the wand out of the stopper, all the while maintaining an iron grip with my left hand. Despite the care I took to prevent a powder explosion, that little bit of force caused the minerals that were coated on the cap tube and wand applicator, to fly everywhere. I had sparkly things on my arms, my thighs and in my nostrils. That was not cool. I also tried applying Demure with the doefoot, and it was an epic fail. I had to use a brush to apply and blend it properly, which defeated the purpose of the wand applicator. For a product that was supposed to save time, this took me a lot more time than it normally would. The concept was good but the packaging just did not deliver. It reminded me of a certain blacklisted company and their brilliant eyeshadow roll-ons. These eye wands cost more than a normal eyeshadow, so I was very glad that Karen generously allowed it to be picked as our free eyeshadow. I wouldn’t have gotten it if I had to pay for it, because of all the reviews I’ve read about the impractical packaging. I will most probably empty it out into a 10g jar, as one of the ladies from my forum who emptied hers out mentioned that the eye wand tube contains more product than a 5g jar can hold. I completely adore Demure, it is utterly gorgeous and I will be reaching for this colour often. While I do loathe the eye wand packaging with a passion, I am willing to overlook the absurd doefoot applicator because the colour and texture of Demure makes up for it. If I were to buy Demure again (and I definitely will! ), I intend to write to Karen to request that the eyeshadow with the FCO addition be put in a jar instead, and to forgo the eye wand. You can request for these eye wands as your Gift with Purchase if you spend $30 and above. Thanks for sharing! The swatches look great! Another negative for the eye wands. That makes me sad since Karen usually comes out with really great ideas. Maybe with enough negatives, they’ll keep the formula but switch the colors to jars. I haven’t picked up any of the eye wand shades, and I don’t really plan to at this point. The idea was great… but the wand just didn’t work. However, the CS at SN is top-notch, so if and when you do decide to order, it wouldn’t hurt to ask them to put it in a jar instead.